1) Who is the coach & what is Hex Offence / Flex Defence? Felix Shardlow is an Ultimate Frisbee player (since 2000), coach (since 2002 – 1,100-1,400 sessions), strategist, analyst, cameraman, and commentator. Hex/Flex are modern strategies in ultimate frisbee which champion communication, dynamic teamwork, balance & shape, and are being adopted rapidly around the world by teams at the cutting edge. Felix is the creator/discoverer of Hexagon Offence and Flexagon Defence, and has been playing, coaching, and analysing these strategies since 2012. He has been playing ultimate since 2000 and coaching since 2002, including playing for and coaching Great Britain teams. His website – felixultimate.com – hosts videos, analysis, reports and articles from his unique perspective on the game. For a full bio check out http://felixultimate.com/about-felix/. He has been planning and running ultimate frisbee training sessions since 2002 – totalling 1,100-1,400 sessions. He has also been in demand more recently to run weekend-long clinics focused on Hex strategies, and has conducted many Live Online Video Analysis sessions with clubs around the globe. He specialises in coaching hex (balance, shape, communication, teamwork), and is well versed with vertical, horizontal, split, and side stacks, & 1-to-1, zone, and hybrid defences – more than able to coach these strategies as appropriate. Hexagon Offence and Flexagon Defence are exciting new strategies which are taking the world of Ultimate Frisbee by storm. Their main principles revolve around communication, dynamic teamwork, balance, shape, and trust in the intelligence of your supporting teammates. The quick-moving, fast-thinking style these principles encourage has already been adopted by many competitive teams around the world since their conception by Felix in 2012, and they introduce a new paradigm for teaching the fundamentals of the sport of ultimate to beginners. Video analysis of footage of your choice, done live and online with your team watching & interacting via live chat on YouTube. A live online video analysis session involves your team following a YouTube link at a specific time/day, and joining Felix live as he goes through video footage of your team playing and provides strategic, tactical, and technical analysis, with focus on the particular areas the captain/coaches want to look at. Your team (of any number) can chat to each other, interact, and ask Felix questions in real-time via the Live Chat window. To see demonstrations of Felix’s analysis, check out this live session with Oakland from San Francisco, or this offline video of Japan v USA analysis. Why will Live Online Video Analysis benefit my team? Video Analysis is widely considered to be the most efficient form of learning in the modern technological age. Felix’s setup allows him to pause, rewind, and slow down the footage, meaning he can show players great detail about the root causes of turnovers, the critical movements which helped generate scores, the factors which affected throwing decisions, and every other aspect of the game. Combined with the ability to draw on the screen, Felix is able to illustrate alternative options and movements which could have been explored, giving all participants a full and deep understanding of the play. The analysis coming from an experienced coach who is external to the team means every player can learn about their current strengths and weaknesses from an unbiased source, which is healthy as it avoids historical relations and team dynamics coming into play. Live Chat enables players to ask questions and talk to each other during the analysis, so topics your players wish to know more about can be elaborated upon, and a positive vibe can be maintained through feedback and banter. What do I need for Live Online Video Analysis? Footage of your team playing is essential, and the quality of the analysis possible depends upon the quality of the footage available. If your team has ever been filmed by Ulti.TV (including being broadcast on fanseat) then this is ideal. If you wish to record your own footage then this is possible, however any drop in elevation / control / quality does have a negative effect on the analysis due to visibility. If you wish your games or training to be professionally filmed by felixultimate, see the ‘felixultimate filmed training’ option above, or get in touch for a quote. Teams are expected to provide felixultimate.com with the footage for analysis at least 3 days before the session — either through upload or a URL. There are a range of packages available from Public to Pro, depending on your team’s preference and budget. One session covers 1 match, and lasts between 2 and 3 hours. For block bookings discounted rates are available, and if you have no budget currently, send us an expression of interest and a link to the match you want to see analysed – it will be added to a list of potential future free sessions on Twitch or YouTube. A weekend-long strategy clinic for up to 45 people, centered on Hexagon Offence and Flexagon Defence strategies and the movements, shapes, and techniques which are suited to them. What is a Hex Clinic? A Hex Clinic is a full weekend of ultimate frisbee learning & development, through games, drills, exercises, and theory sessions. The focus is on defensive and offensive tactics and strategy – participants will learn about fundamental teamwork skills including communication, switching and sandwiching, maintaining shape & flow on offence, and individual techniques such as versatile quick throwing, accelerating out of throws, and balance control whilst passing & moving / dribbling. The clinic serves as an introduction to Flexagon Defence and Hexagon Offence – comparatively new and innovative approaches to ultimate which are taking the world by storm as they are being adopted by teams from Australia to the USA, bridging the strategic gap between ultimate and other team field sports, and ushering the game into a new era at both the grass roots and the elite level. A Hex Clinic includes everything you need to know to train, play, and develop these strategies and their connected skills yourself – presented by Felix. Check out these reports from previous Hex Clinics, and videos of the defensive ‘surrounding the stack’ drill, and of the offensive ‘dribble slalom race’ as examples of drills run at the clinic. What will a Hex Clinic do for my team? Everyone attending the clinic will develop multiple new abilities, including: (1) high level understanding of field space, strategy, and balance, (2) on-field communication skills, awareness, and cooperation, (3) utilisation of teamwork to gain advantage on defence, (4) ability to create & use space dynamically on offence, and (5) the ability to accelerate out of throws without traveling, and string these moves together to achieve ‘dribbling’. As a team, you will be equipped with two powerful new weapons – a defence which is an effective counter-strategy to stack offences (particularly those which are disciplined and well drilled), and an offence which is fun, helps you win, develops all players’ skill-sets evenly, and works against any defence. As Full Hex Clinic (with video analysis), but only one coach will attend, meaning the session should be limited to 25 players maximum. Includes video analysis. As Full Hex Clinic (with two coaches), but with no video analysis of the practical session, and no post-clinic live online video analysis of the games in the week after the clinic. The Budget option includes just one coach, no video analysis, and the player fees are split 50-50 between the host and felixultimate. The Pro option is for AUDL or otherwise funded teams. Felixultimate will send 2+ coaches, provide full video analysis during and after the event, no footage from the clinic will be released to the public, and there will be no mention of the Hex Clinic online until after the relevant season is over – meaning you keep the element of surprise over your competitors. The host’s responsibilities are to find and book a suitable venue, secure sign-ups, and collect player fees. What is meant by a suitable venue? For each day of the clinic, we’ll need an indoor space that fits all attendees for 10-1pm and 3-4pm (for the theory and video analysis sessions and for lunch). Please ensure there is a projector and whiteboard and each attendee can sit on a table. We’ll need an outdoor space for the practical session and games from 1-3pm and 4-5pm: one pitch for less than 30 attendees; two pitches for 30 or more attendees. If the clinic is being filmed for video analysis, the host must also secure a power connection, a shelter, a table and a chair for the sideline of the field. 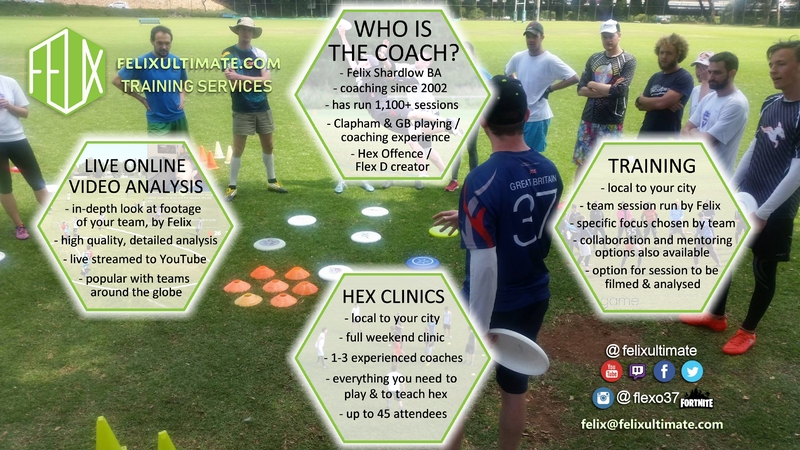 To work out the details and get an exact quote please get in touch with felix@felixultimate.com – we understand each team is unique and may have different requests and aims, and our costs vary depending on the Hex Clinic location. You may wish to consider collaborating with another local club to book a Hex Clinic, and competing against each other in the games at the end of each day. Individual training sessions coached/filmed by felixultimate. Instead of a full weekend Hex Clinic, Felix can be booked to run, film, and/or analyse individual trainings – as one-off sessions, or as a series. Felix’s experience of running 1,400+ training sessions means he can construct exercises, drills, and games to develop your players skills and understanding – focused on whatever you believe your team needs. For example, if your team is learning Hex then one session can cover either “maintaining hex shape”, “movement in hex”, or “balance control & technique”. Sessions can be aimed at any level of experience from complete beginner to international veterans. Felix will collaborate with you in planning the session, will offer constant feedback on individual techniques, player tactics, and team strategy, and at the end will provide a summary of where he believes the team is at & where they need to focus in the weeks following the session. Note that one session is not enough to fully learn Hex or Flex strategies, but enough to introduce some of the concepts involved. Felixultimate can also professionally film your team’s training using equipment from ulti.tv. This immediately raises the level of concentration and play at your training, and enables high-level analysis to be completed after the event. 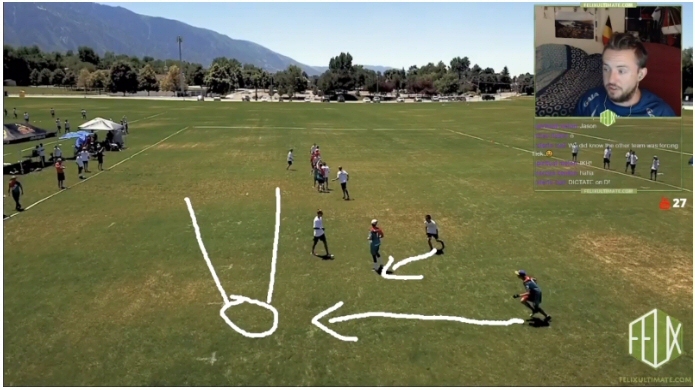 Players learn about their strengths and weaknesses simply from watching themselves play, and if combined with a felixultimate Live Online Video Analysis session post-event (see next page), they will have a permanent record of high-level analysis from Felix on their play – both individually, and as a team. If you wish to have Felix’s expertise without him directly running or filming the training, he can play the role of mentor – collaborating on planning the session, attending, and offering feedback and advice on every part of the session from the warm-up to the post-training huddle. This can also be done remotely. Contact felix@felixultimate.com to discuss details and arrange block bookings at a discounted rate.